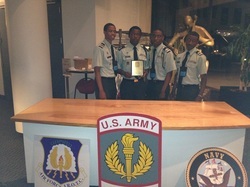 The Leadership Team consisting of Cadets Torrey Sales, Jermaine Green, DaVaughn Hambright, and Kauri Royal traveled to Washington, DC during the week of 22-26 June to participate in the 2012 Championship round of the JROTC World Leadership Symposium. The team was among other elite teams from Japan, Europe, Guam, and the continental United States. Of JROTC teams world-wide, our team finished 39th in this exclusive and competitive competiton. Cadets traveled to the National Mall as well as Arlington National Cemetery visiting such sites as the World War II Memorial and the Tomb of the Unknown Soldier. Additionally, they completed a group project with other teams while developing a team video logging their efforts for the week. Cadet Torrey Sales was selected to introduce the guest speaker, Commanding General of the Army War College in Carlise, PA, for the Academic Team Championship Awards presentation on Saturday evening. Among citations received by the team was a personal letter from General (Ret) Colin Powell, founder of America's Promise, congratulating them for their achievements in reaching this level of the competition. The team was accompanied by Major (Ret) Wilford Blowe, Senior Army Instructor, and received many laudatory comments on the team's efforts during the competition.